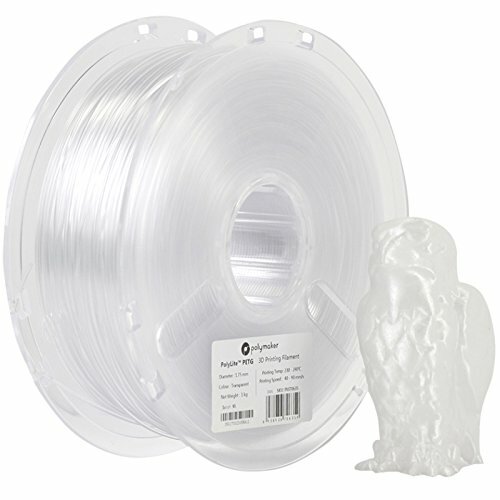 Excelent Compatibility: A 1.75 mm PETG filament compatible with Makerbot, FlashForge，Monoprice，XYZprinting，ALUNAR and other popular extrusion based 3D printers (Heated bed required). Wallet Friendly: PolyLite PETG 3D printer filament is a truly plug and play 3D printing material that offers you highest and consistent quality at an affordable price. Easy to Print:Works well with all common printing surfaces such as the blue tape, Kapton tape, glass, BuildTak, etc. Uncompromised Quality: With Polymaker's eight-step quality control process and rigorous in-house testing, you can rest assured that PolyLite will produce beautiful, reliable and accurate printed parts every time. On Line Support: any questions or problems please leave us a message. A Polymaker engineer will get back to you within 24 hours. Polymaker has worldwide distribution centers located in Europe and North America. All Polymaker filaments are researched, developed and manufactured in house at Polymaker's Headquarters in China. If you have any questions about this product by Polymaker, contact us by completing and submitting the form below. If you are looking for a specif part number, please include it with your message.